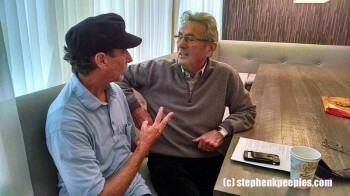 Ceremony Outside Capitol Tower Set for Thurs., Aug. 13 at 11:30 a.m.
Al Schmitt, the most honored recording engineer and producer in Grammy history with a total of 23 awards, will be inducted into the Hollywood Walk of Fame on Thursday, Aug. 13. The induction ceremony, open to the public, starts at 11:30 a.m. on the sidewalk outside the Capitol Records tower at 1750 N. Vine Street in Hollywood. 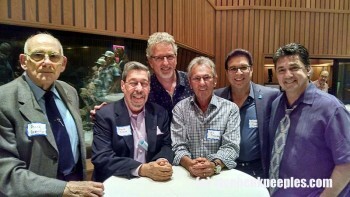 Al Schmitt at the board in Studio A, Capitol Studios, Hollywood. Photo: Stephen K. Peeples. Emcee will be Leron Gubler, the Hollywood Chamber of Commerce president/CEO, and speakers slated include Joe Walsh and special guests, according to the chamber. “I’m still stunned by it,” Schmitt, 85, told this writer in an exclusive interview shortly after the chamber announced he’d be among the 2015 inductees. Schmitt, who has more than 150 gold and platinum albums to his credit as engineer and/or producer, receives the 2557th star awarded since the chamber established the Hollywood Walk of Fame in 1960. It’s appropriate Schmitt’s star-shaped terrazzo and bronze award is in the Recording category, and located in front of the Capitol Records tower at 1750 N. Vine Street, also home of Capitol Studios, where he has engineered and/or produced scores of sessions since the early 1970s. 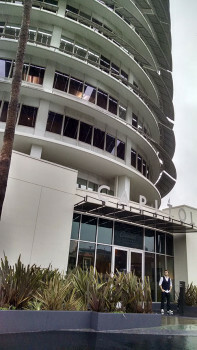 Capitol Studios, Hollywood, Dec. 2, 2014. Photo: Stephen K. Peeples. “The first thing I did at Capitol was a record with Michael Franks. I think that was, like, ’72,” he said. “‘Popsicle Toes’ – yeah, that’s one of the cuts that we did. Back then I was doing production work at Sunset Sound, Hollywood Sound – I was all over. But coming to Capitol was always a thrill and I liked working here. “Then I did ‘Breezin” with George Benson (in January 1976), and that was it. From then on, it became like home to me,” he said. While he never recorded a Beatles album, Schmitt engineered Sir Paul McCartney’s Grammy-winning “Kisses on the Bottom” LP in 2012. The two collaborated on the subsequent “Live Kisses” DVD, which won “Best Music Film” for the artist and “Best Surround Sound” for Schmitt in 2013. Multiple-Emmy-winning music telecast producer Ken Erlich tagged Schmitt to mix “The Beatles: The Night That Changed America” TV special at Capitol Studios. Spotlighting The Beatles’ arrival in the U.S. for “Ed Sullivan Show” appearances and concerts in New York and Washington D.C. in February 1964, the highly rated program earned a 2014 Emmy nomination in the “Outstanding Sound Mixing for a Variety Series” category. Just in the past year, Schmitt has worked at Capitol Studios on separate projects with music legends Bob Dylan (“Shadows in the Night”), Neil Young (“Storytone”) and Burt Bacharach (a Christmas project), among others. A previous nominee for Henry Mancini’s Oscar-winning “Moon River” theme, Schmitt won his first Grammy in 1962 for creative sound engineering on the famed composer’s soundtrack for the African safari movie “Hatari!” starring John Wayne. Benson’s “Breezin'” was indeed Schmitt’s breakthrough record as an engineer. Out in May 1976, the album was also a game-changer for the artist, and one of the first massively popular “smooth jazz” records. He won engineering Grammys for “Toto IV” in 1982, Natalie Cole’s “Unforgettable…With Love” in 1991, Jones’ “Q’s Jook Joint” in 1996 and Krall’s “When I Look into Your Eyes” in 1999. Schmitt and Krall reunited in 2001 for “The Look of Love” (he won the “Best Engineered Album” honors) and 2002 for “Live in Paris” (“Best Jazz Vocal Album” producer/engineer). 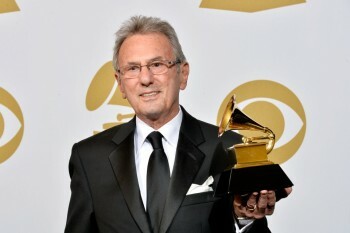 Schmitt received the Lifetime Grammy Achievement Award from NARAS in 2006, the same year he won a Grammy as producer-engineer of Chick Corea’s album “The Ultimate Adventure.” Schmitt reconnected with Natalie Cole in 2008 for “Still Unforgettable,” which won “Best Traditional Pop Vocal Album,” and in 2010 his production of singer Dee Dee Bridgewater’s Billie Holiday tribute “Eleanora Fagen (1915-1959): To Billie with Love” won the “Best Jazz Vocal Album” honors. His most recent Grammy wins were the aforementioned McCartney collaborations, and it’s highly likely Schmitt’s trophy tally will continue to climb past 23 in the next couple of years. He is still is great demand among A-list artists, approaches his work as not work, just doing something he loves, is in good health, and has no desire to wind it down and give up his studio tan anytime soon. Born in Brooklyn on April 17, 1930, Schmitt learned the art and craft of audio engineering while still in grade school, from his uncle, Harry Smith, who owned the famed Harry Smith Studios on West 46th Street in Manhattan. Schmitt rode the subway to the studio by himself on weekends, starting out by sweeping up, winding cables, breaking down equipment after sessions. He paid close attention and took copious notes during his uncle’s sessions about the setups for musicians and mikes. Guitarist, inventor and engineer Les Paul was a frequent visitor to Smith’s studio and an early Schmitt mentor who became a lifelong friend until Paul died in August 2009. Schmitt also noticed his uncle always had a wad of cash, dressed sharply, and took him out to eat at the best New York restaurants. “Everything he was doing, that was for me,” Schmitt said. Schmitt’s first solo session as a teenaged rookie engineer was recording a big-band date for the Duke Ellington Orchestra with Billy Strayhorn in the mid-1940s. With Schmitt’s notes and Ellington’s patient encouragement, they completed the session. “It wasn’t my best work, but it wasn’t my worst,” Schmitt said. With guidance from his uncle and further encouragement from mentors like Paul, who used to tousle the kid’s hair every time they met, even years later, Schmitt learned the best miking techniques of the era, and then began developing his own techniques. As an early adopter of close-miking, he became known for a clean, rich, natural sound so present, it puts the listener right in the studio with the artist. Peeples: “That’s twenty-THREE Grammys, right?” Schmitt: “Right.” Photo: Mike McAteer. As an independent producer and then staff producer at RCA in the ’50s and ’60s, Schmitt recorded classics by Sam Cooke, Bobby Darin, Eddie Fisher and Ann Margret, and later worked with Jefferson Airplane, Jackson Browne and Neil Young. In addition to the aforementioned artists, Schmitt’s worked on recordings by Rosemary Clooney, Dr. John, Mel Brooks, Dave Mason, and many others. Schmitt’s career arc has included mono acetates, sound-on-sound overdubbing on magnetic tape, analog multi-tracking to tape, and the transition to digital that started in the late 1970s. 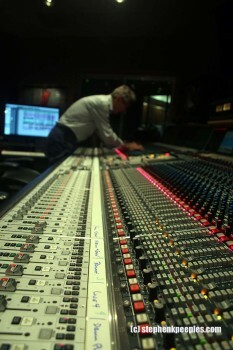 His favorite board in Studio A is completely digital, state of the art. Now, he edits and mixes to a file using ProTools and/or Final Cut Pro. Like few of his peers, Schmitt has stayed on the bleeding edge of engineering and recording tech since he was a kid back in uncle’s studio. All the above just scratches the surface of Schmitt’s illustrious and enormously influential career. His credits are so extensive, a far shorter list would be artists he has NOT worked with. Schmitt was inducted into the TEC Awards Hall of Fame in 1997, honoring his creativity and excellence in recording and sound. In September 2014, he received an Honorary Doctorate from Berklee College of Music. And now, he adds a star on the Hollywood Walk of Fame to his accolades and awards. What’s next for an 85-year-old living recording industry legend who has the energy of someone 20-30 years younger? For more info, visit the Al Schmitt Music and Hollywood Walk of Fame websites. Find your favorite star on the Hollywood Walk of Fame. Special thanks to Paula Salvatore, Charlie Paakkari and the Capitol Studios staff. Grammy-nominated producer, former Capitol Records editorial director and Santa Clarita journalist Stephen K. Peeples was an entertainment reporter for Santa Clarita television station SCVTV and its website at SCVNews.com, and for Santa Clarita radio station KHTS AM 1220 and its website at HometownStation.com, from 2011-2015. He hosted and co-produced SCVTV’s WAVE-nominated “House Blend” music and interview program for five seasons, 2010-2015, creating 69 shows spotlighting local artists performing their original material. Peeples was also an award-winning international radio producer and newspaper online editor, and an in-demand website project manager and content editor. He blogs at his personal site, http://www.stephenkpeeples.com.